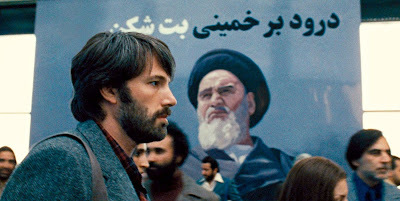 I have mixed feelings about the recent popular war caper film, Argo (2012). 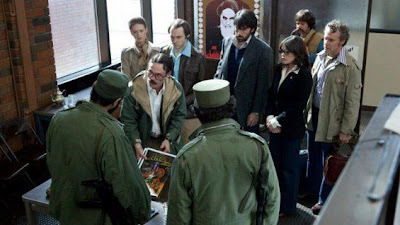 True, the film about the CIA rescue of six US Embassy professionals from the Iran during the 1979 hostage crisis has been a huge success at the box office. And the film has been racking up plaudits right and left, such as seven Oscar nominations for the US Motion Picture Academy Awards, including one for Best Picture, and it has already won the Best Picture - Drama and Best Director awards at the Golden Globes. But there are things that bother me about this film and that I have difficulty accepting. The problem comes down to authenticity, which is actually a core theme of the movie story. Of course, every film invites the viewer to suspend his or her disbelief and accept that what is happening on the screen is real. In the case of Argo, though, we have a story that is based on real events that took place in 1979-80. In particular, the film is supposed to be revealing a previously unknown story that is part of an important historical “moment” in modern US and Iranian history. The details of the story were classified until 1997 and first revealed to the general public via Joshuah Bearman's 2007 article in Wired magazine . So we expect that in this particular case there would be a meticulous effort to tell the story as authentically as possible. Unfortunately, this isn’t quite true. The film, directed by Ben Affleck and scripted by Chris Terrio, takes some significant liberties with the truth in order to concoct an edge-of-the-seat thriller. The film begins with a quick background in voiceover covering events leading up to the 1979 Iranian Revolution. Then the embassy is violently attacked and overrun by an angry Iranian mob. Since the embassy grounds were relatively large, the six staff members in a separate office were overlooked for a short period, which gave them a chance to escape out the back onto the Tehran streets. They found refuge and went into hiding in the Canadian embassy, but their safety was not assured. The US government was in an uproar, and there was the usual back-and-forth tussling between the State Department, the military, and the CIA. 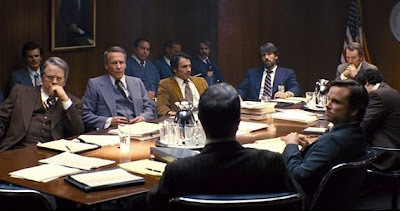 Eventually Tony Mendez (played by Ben Affleck), an expert “exfiltrator” (someone who gets valued personnel out of dangerous places), was assigned to try to rescue the six US staffers at the Canadian embassy. He and some colleagues come up with a crazy plan: to dress up the six US refugees as Hollywood film production personnel who have gone to Iran for some location scouting in connection with their planned Sci-Fi film, whose intended name was Argo (inspired by the Greek legend of Jason and the Argonauts). The whole thing, of course, is a scam to fool the Iranian authorities at the airport. Mendez arrives in Iran and goes to the Canadian embassy to tell the US personnel about his plan. They are flabbergasted by it outlandishness, but have no other options than to go along with it. Mendez first dresses them up in Hollywood-looking garb and takes them to the main Tehran Bazaar to scout locations – a completely crazy idea. Even if the Tehran Bazaar were to have some architectural suggestiveness that would go with their weird science fiction script (which I find impossible to believe), it would not be a practical location for arranging a film shoot. With Mendez and an Iranian guide, they all go to the Bazaar in their costumes virtually asking for trouble. One of the embassy women is even shown taking Polaroid snapshots of local people, behavior which I can’t believe the CIA would be so ignorant as to allow to be part of the group's activities (you might think that it was no wonder that the Iranian Revolution hit them as a complete surprise – but then, this bizarre Bazaar scene apparently didn't take place in reality). Naturally a ruckus ensues over this, and the entire group barely makes it back to the Canadian embassy. The next day they all proceed to Mehrabad Airport and try to get past the Iranian security personnel and get onto the commercial plane headed out. There are some big-time moments of tension throughout this section, but they do manage to get on the Swissair plane and fly out to safety. There really are some good elements of Argo, but first I will go over my reservations, which pile up more and more as the film moves along in it early stages. It is only at the end during the “Getaway” that the good things begin to take over. An irritating aspect of the film throughout is the heavy-handed cinematography. There is a never-ending sequence of swish-pans, jarring closeups, and rapid, short-cut edits, all presumably to connote a tense and frenetic atmosphere. It is like a 30-second TV ad that never ends, and it winds up cheapening the film. But, as alluded to above, the main problem with the film concerns the distortions of fact. These have been discussed elsewhere [1,2,3], and I won’t go through all of them here. Note that there are two different aspects to the distortions: the general overall representation of the Iranian reality and the specifics concerning what actually happened in the caper. With respect to the depiction of Iranian society, the film makes it look like Iranians were largely overheated thugs. It is true that there was a certain amount of chaos in Tehran at that time, with loosely organized Pasdaran (revolutionary guards) and Komiteh (ad hoc revolutionary committees) creating havoc; and these elements could pop up and cause trouble for anyone at any time. But the film makes it look like the streets were crawling with angry and fanatic mad dogs. In fact most Iranian people were generally upbeat and thrilled at what they had accomplished – overthrowing a dictator via "people power" – perhaps much like the Egyptian and Tunisian people may have felt after the Arab Spring. So there was a lot of good will on the Iranian streets. But Argo makes it look like the people were fashioned into an army of fanatics. Even (Argo’s) Iranian crowd’s chanting of “Marg bar Shah” (“Death to the Shah”) seems to have a cadence that is too rapid, too much like synchronized barking dogs, compared to what I have seen and heard. In connection with the actual getaway caper, itself, there are a number of inaccuracies, which you can find listed in these references: [1,2,3]. Notably, the visit to the Bazaar apparently didn’t really take place, the confrontation with the Pasdaran at the final airport check-in didn’t take place, and the final car-chase along the runway didn’t take place. These things that didn’t really take place are major components of Argo. In addition, the involvement of the Canadian Embassy staff was misrepresented and underplayed. On the other hand, there are some strong points to the film. Some of the acting is good. Ben Affleck, as Tony Mendez, doesn’t look or act much like a Mexican-American, and he may be a bit too cool, like a latter-day James Bond, but his low-key performance is effective. Alan Arkin and John Goodman, who both appear as Hollywood professionals in the second stage of the film are good, especially Arkin, a favorite of mine. And the final section of the film is indeed very gripping. In fact the confrontation at the airport check-in with the Pasdar, which didn’t actually happen in the real story, is one of the best sequences of the movie. In sum and looking through all three sections of the movie, I would have to assess those parts of the film separately. Section 1 (The Staff Members Escape) is a failure. In the background commentary at the beginning, it claims that Mohammed Mossadegh, who was deposed in a 1953 coup, had been "overwhelmingly elected as Prime Minister" – this is an exaggeration. It says that the US installed Mohammad Reza Pahlavi as their puppet Shah in that coup – again a misleading and over-simplified statement. Then the film introduces the viewer to the US embassy personnel and shows the 52 captured hostages being blindfolded and subjected to brutal harassment – but then it simply drops them from view and never comes back to them, which is a narrative shortcoming. The film later shows US diplomatic personnel back in Washington running around cursing and metaphorically slamming their fists on tables. This is basically ham-acting. In addition this section misrepresents Iran and the Iranian people of that time, as well. Section 2 (The CIA’s plan) is also a failure. This section crudely mocks cheap, glitzy Hollywood, but again, there is no subtlety here. Some critics found it hysterically funny, so you might like it. I found it boring (even with Alan Arkin’s participation, which was good). Section 3 (The Getaway) is a stunning success, if you take it on its own terms. It turns the film into a war caper movie, and it pulls it off well. So the entire film rests on the strengths of the third section. But on reflection, maybe I am being too harsh. After all, classic war caper films like The Great Escape (1963) and The Bridge on the River Kwai (1957) may have misrepresented the reality of the war and the character of the German and Japanese combatants, but we still generally accept those films as simply action/adventure yarns, whose “truth” didn’t really matter. If that’s all Argo ultimately is, then you might say it is good. But even on that reckoning Argo can't match the drama and quality of another film that covered people trying to flee a revolutionary environment, Peter Weir's The Year of Living Dangerously (1982). And Argo's pretensions of presenting the authentic inside story of an important historical event should be dismissed. Joshuah Bearman, “How the CIA Used a Fake Sci-Fi Flick to Rescue Americans From Tehran”, Wired Magazine, April 24, 2007, http://www.wired.com/magazine/2007/04/feat_cia/all/. Nate Jones, “The True Spy Story Behind Argo: The internal CIA account of how the Iran rescue really went down”, Foreign Policy, October 8, 2012, http://www.foreignpolicy.com/articles/2012/1/18/the_true_spy_story_behind_argo?page=full. 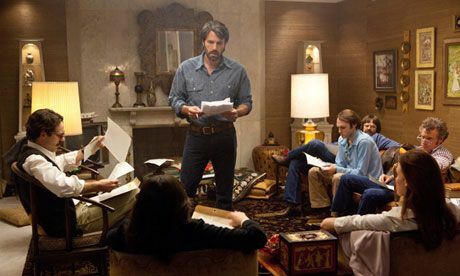 David Haglund, “How Accurate Is Argo?”, Slate, October 12, 2012, http://www.slate.com/blogs/browbeat/2012/10/12/argo_true_story_the_facts_and_fiction_behind_the_ben_affleck_movie.html. Well... little by little I am knowing more about you... Your English is pretty good but it is not your mother tongue. After seeing the long list of Iranian movies commented in your blog I think I wouldn't lose too much money if I bet on farsi. Marjane Satrapi, Panahi and Kiarostami are three names known in the West by people interested in films but, beyond that, there is a void, a land that they (well... we) never crossed. However, you seem to know it very well and live on it. Argo is a mediocre film and not accurate but if we take into account the context it looks like a bit naive to pinpoint in detail some of its inaccuracies. People spend more in videogames than in films and music together and a film industry like Hollywood, if it wants to survive, must adapt with more and more contorted plots, more and more (false) drama and action... Anyway, you discovered new inconsistencies that I didn't know before.